But Chong, who was responsible for federal-provincial relations, was left out of the loop when Harper was deciding on the wording of the motion. Instead, the prime minister consulted with former intergovernmental affairs minister Stéphan Dion. 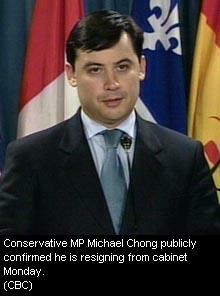 Chong can talk all he wants about his philosophical opposition to this nationhood notion. He probly ain't lyin' neither. But you gotta know a snub like that from his own leader can't go unanswered. Help! I've written and I can't get up! I am the altered ego of He-Who-Shall-Remain-Nameless, currently serving a seven year term at the Yoni School for Wayward Poets. I was charged and convicted of phelonious misspelling and operating without a poetic license. Mindfulness is the miracle by which we master and restore ourselves. Consider, for example: a magician who cuts his body into many parts and places each part in a different region--hands in the south, arms in the east, legs in the north, and then by some miraculous power lets forth a cry which reassembles whole every part of his body. Mindfulness is like that--it is the miracle which can call back in a flash our dispersed mind and restore it to wholeness so that we can live each minute of life. - Thich Nhat Hanh, "Miracle of Mindfulness"
Breaking News: Louis Riel Hanged! Hey man, where's my pitchers? Get the Canadian Centre for Policy Alternatives widget and many other great free widgets at Widgetbox!